Annie Clara Rishton, aged 25, and Henry Greener, one year older, married in the district of Lanchester in 1890. It’s not easy to imagine how the daughter of a draper and Methodist Preacher from Rochdale, Lancashire, met this self-made man born in Burnhope. What it is known, anyway, is that soon after the marriage they settled down in Craghead where, according to 1891 census, Henry was working as a colliery clerk and where, as recorded in 1901, he was also a Local Preacher. It was in Craghead that, on 10 January 1894, their eldest son Henry was born. The fair-haired little Harry (“no one ever dreamt of calling him anything else”, The Stanley News, Thursday, 3 May 1917) was a wholesome, straight and truthful boy foremost in school sports. He grew up tall and lithe and his passion for sports never abandoned him even when he left school and started working as an apprentice surveyor in a colliery (1911 census). Harry was a keen athlete and by the time he became an assistant mining surveyor for South Moor Collieries Company, he was a member of the South Moor Cricket Club, a member of the Stanley hockey team and also a devotee of tennis. Harry’s involvement in all these local activities shows how popular and loved he was both in Stanley and in Craghead, where all his family was well-known and respected. Harry’s commitment to the communities where he lived, worked and played became even more evident at the outbreak of war. In December 1914 he enlisted as an orderly in Lady Hadfield’s Hospital in Wimereux, being “one of the first men in the Craghead district to volunteer”, as highlighted in The Stanley News of Thursday 26 April 1917. He served with St John’s Ambulance Brigade on the Western Front and, on 20 August 1915, was commissioned and appointed to the 6th Battalion Durham Light Infantry (DLI) as a Second Lieutenant. Even though newly-commissioned, Harry became very popular both with his men and his fellow-officers. As the four letters from his pals published in the article cited above show, he made many friends and never gave up his fondness of sport. 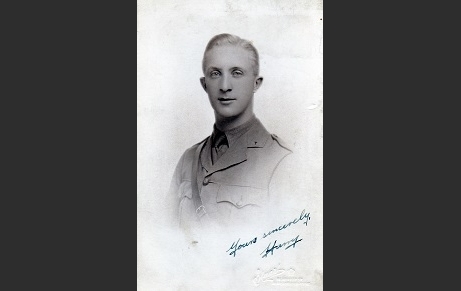 According to Second Lieutenant C. H. Stuart, his friend and author of one of the letters, Harry “always took a keen interest in sport, and was always first to organise football matches and other sports for the men when out resting”. Despite Harry’s commitment to cheer troops and officers up, duty called and he was once again in France in February 1917. Unfortunately, Harry’s time overseas was very short. He went on active service and was with his Battalion when it marched to Morcourt, in the valley of the Somme, on 9 March 1917 and camped there until the end of the month. In “The Faithful Sixth” by Harry Moses, Harry is mentioned as a member of a recreational committee formed to improve the soldiers’ mood. “A Battalion concert was held in the Recreation Hut on the evening of the 14th March” and, obviously, “football competitions started” as well as a Brigade boxing competition but, by 31 March, the Battalion was again on the march, heading toward the Arras front. 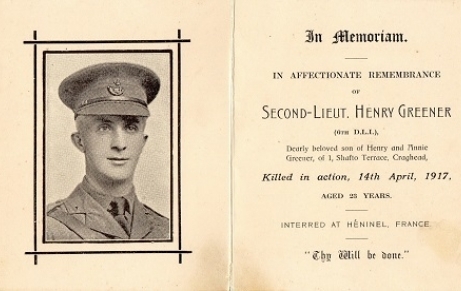 In the morning of 14 April 1917, during a 6th Battalion DLI’s advance, Second Lieutenant Henry Greener was shot in the head by a high explosive bullet and died. As reported by his fellow-officers, Second Lieutenant Tom Rushworth, Captain F. Walton and Second Lieutenant, O.C., C. H. Stuart, Harry fell and died immediately and was buried with full honours. Private W. Lee, his servant, sent all Harry’s belongings to his family, except for the watch he wanted to keep in remembrance of his officer and friend. The terrible news must have reached Harry’s parents and siblings while they were already concerned about the state of John William, Harry’s younger brother, corporal in the Northumberland Fusiliers, who was at that moment lying wounded in Bradford. 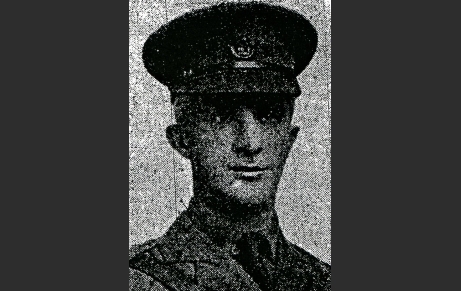 Despite all these sufferings, by 12 July 1917, Harry’s father, Henry, was part of the Reception Committee that Craghead set up to welcome the Victoria Cross winner, Private Heaviside. He pronounced words of admiration in order to celebrate the arrival of this local hero while is hero son, the beloved Harry, was believed to be buried in the Wancourt British Cemetery, deceased less then three months before at the age of 23.